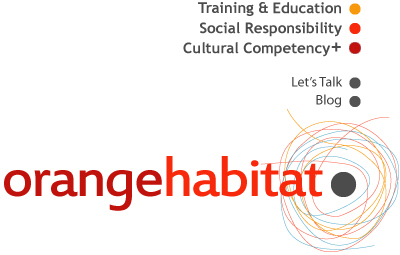 Orange Habitat helps organizations, service providers and businesses move beyond traditional definitions of cultural competency that are stuck in generalized labels of identity and preconceived assumptions of behaviour. Delivering truly competent service, and creating a healthy, functional work environment requires a deeper understanding of the complexities of lived experiences that clients and employees bring to the workplace. Assess your organizational culture and provide a map of your employees and stakeholders that uses indicators not often identified by traditional diversity count methods. Explore meaningful personalized service that acknowledges individual needs and unique complex identities. Provide training on how to best utilize a cultural competency+ awareness to improve services and organizational cultures. We understand that every organization and work environment is different. There is no one size fits all formulas or solutions. We will work with you to plan, design and implement options that are unique to your needs.